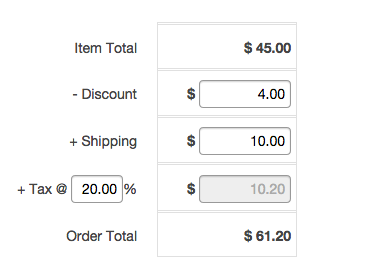 This week we improved the way we were handling tax calculations for orders. Previously, tax was calculated based on your account’s base tax rate for all orders automatically. From feedback we received, it was clear that this wasn’t flexible enough to cope with businesses that traded across different tax bands and also for orders exempt from tax. Your tax rate is now configurable per Order - you will now find a textbox on your Orders page that will allow you to change your rate from your default tax rate if need be.